Presidio Residential Capital and Family Development will open model homes in mid-November at The Ridge at Troon North, a 66-unit community on the fairways of the Troon North Golf Club in Scottsdale, Ariz. Nine units have already been sold at The Ridge, the project is expected to be completed in Spring 2017. The retail value of this project will exceed $30 million. Thirteen Southwest-style 5-Plexes will be built by Family Development on the site that already has seven existing buildings with 35 units already completed for a total of 100 homes in the community. The community is located on the fairways of Troon North Golf Club which is on Dynamite Road approximately two miles east of Pima Road in North Scottsdale. Upon purchasing the property, which had been in foreclosure since 2007, Family Development took the same footprint of the existing buildings and completely re-designed all of the interiors to arrive at five brand new floor plans. Each building at The Ridge will feature five condominiums with two units on the ground level and three units on the second level. All of the units will feature two- and three-bedroom homes ranging in size from 1,381 to 2,088 square feet (most with two-car garages), and will be priced from the low $300,000s to the low $500,000s. Since Family Development recently sold out of its final phase of homes at a similar community nearby, Pinnacle Pointe, demand for the homes at The Ridge has outstripped supply explains Family Development principal, Vincent Barbato. For that reason—and to accommodate seasonal buyers—Family Development released their first two phases of homes earlier than expected. The Ridge at Troon North offers resort-style living at its finest with high-end amenities including an impressive gated entry, a community pool and spa, a fitness center and a barbecue area. The lush, impeccably crafted Pinnacle Course of Troon North Golf Club is just outside the door. With nine-foot ceilings, the sunny interior spaces will have designer ceramic tile, plush carpet, granite countertops, elegant birch cabinetry, Bosch stainless steel appliances, cultured marble countertops and surrounds, extra-large master bedrooms with patio access and master baths with luxurious relaxing tubs and large showers. Energy-efficient features include dual-glazed low-E windows and sliding glass doors, SEER 14 air conditioning with R-8 insulated ducting, tankless water heaters, low-water toilets and weather stripping. Optional exterior fireplaces are available for most plans. 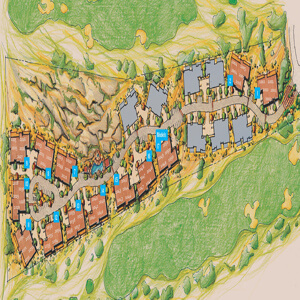 Located conveniently close to hiking trails, golf, restaurants and entertainment, The Ridge at Troon North offers outstanding mountain and valley views and convenient access to main thoroughfares and employment centers. A temporary sales office is located in the gym at The Ridge at Troon North (10260 E. White Feather Lane in Scottsdale). The project is the first joint venture between Presidio and Family Development Homes. According to the National Association of Home Builders’ formula to determine the local impact of single-family housing in typical metro areas, adding 100 single-family homes will generate $28.7 million in local income, $3.6 million in taxes and other revenue for local governments and 394 local jobs.